Welcome to Palestine Today, a service of the International Middle East Media Center, www.imemc.org, for Wednesday, April 27, 2016. Israeli troops kill a woman and her brother at a West Bank checkpoint meanwhile Israeli tanks invade areas in Gaza. These stories, and more, coming up, stay tuned. Israeli soldiers shot and killed, on Wednesday, a young Palestinian woman and her bother at the Qalandia wall terminal, separating the central West Bank city of Ramallah from occupied Jerusalem. The Palestinian Health Ministry said the slain woman has been identified as Maram Saleh Abu Ismael, 24, and her brother Ibrahem 16, from Beit Surik town, north of occupied Jerusalem; Maram is a mother of two daughters. They added that the soldiers fired at the two Palestinians from a distance, and did not even approach them. Eelier on Wednesday at dawn, Israeli soldiers kidnapped four Palestinians in Jerusalem and Hebron, in the occupied West Bank, after searching homes. Among the kidnapped a man who is physically-challenged, Palestinian sources reported. Elsewhere, Several Israeli military vehicles carried out, on Wednesday at dawn, a limited invasion into Palestinian agricultural lands east of the al-Boreij refugee camp, in central Gaza, uprooted them and fired smoke bombs. The army also placed several dirt mounds in farmlands close to the security fence, in order prevent the Palestinians from approaching it. The Israeli army carries out frequent invasion into Palestinian lands in various border areas, in the northern and eastern parts of the Gaza Strip, and prevents the villagers from entering them. 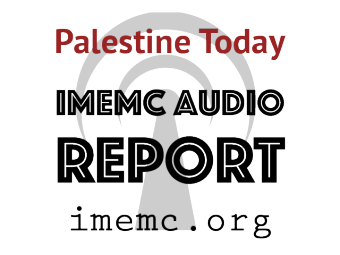 And that’s all for today from the IMEMC News; this was the Wednesday, April 27, 2016, news round-up from the Occupied Palestinian Territories. From more news and updates, please visit our website at www.imemc.org Today’s report has been brought to you by George Rishmawi and me Ghassan Bannoura.